After talking over email for months, I finally got the chance to sit down with Sabrina & Mike over a delicious dinner a few weeks before their wedding. We ended up talking for 3 hours and I’m pretty sure we could have gone for another 3 if we really wanted. After learning about Sabrina’s love of photography, and wanting to pursue it herself, I was even more excited for their wedding, and more importantly what would come afterwards. Less than a month after their wedding, Sabrina packed her gear and headed up to NH with me to shoot Kasey & Shaun’s wedding. We laughed the entire ride up (some hysterical events remain untold) and we did a fantastic job of working together. The greatest thing about photographing weddings is the people you meet. I’ve made quite a few friends along the way, and Sabrina is one of them. 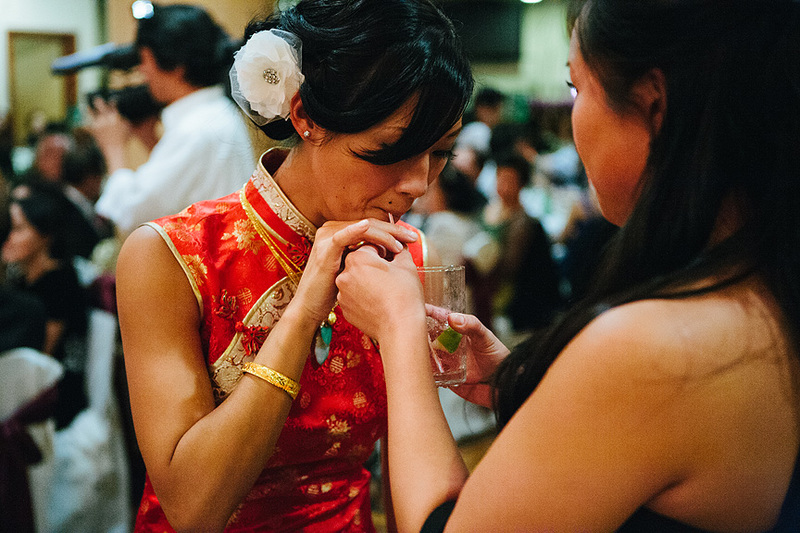 Aside from Sabrina & Mike being awesome, their wedding was the first Chinese Banquet wedding I’ve shot and I loved so many things about it. They had an MC who literally entertained the crowd with his crazy dance moves, and guests sang songs with the band as the dinner courses were served. Sabrina & Mike went around to every single of the 40 something tables where guests gave advice into a microphone that was recording everything they said. The drinks were flowing, and I wish I could have stayed to participate in the craziness that went on late into the night. The last few pictures sum up what the rest of the night looked like, and I was lucky enough to get in a celebratory (straight vodka) shot with Sabrina & Mike at the very end. lovely wedding and super amazing photos, love it Katie! Absolutely some of your best work yet! Love the colors popping off in this one.